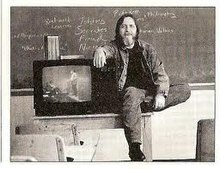 Rick Roderick (June 16, 1949 – January 18, 2002) was an American professor of philosophy, best known for his lectures for The Teaching Company. Roderick was born in Abilene, Texas on June 16, 1949, son of (by his own description) a "con-man" and a "beautician". He was a teacher of philosophy at several universities, where he was much revered by many students for a Socratic style of teaching combined with a brash and often humorous approach. His breakthrough into wider circles came with his engagement with The Teaching Company where he recorded several memorable lecture series. Rick Roderick died on January 18, 2002 from a congestive heart condition. Roderick first studied communication (self-admittedly in order to focus on anti-establishment student and anti-war activities), but moved after a few years towards philosophy. He received his B.A. at the University of Texas at Austin, did post-graduate work at Baylor University and finally earned his Ph.D. at the University of Texas under the supervision of Douglas Kellner. After 1977 Roderick taught at Baylor University, the University of Texas, Duke University and National University in Los Angeles. He was the recipient of the Oldright Fellowship at the University of Texas and served as associate editor to The Pawn Review and Current Perspectives in Social Theory. He served as editor of the Baylor Philosophy Journal and was a member of the Phi Sigma Tau National Honor Society of Philosophy. He presented more than 25 papers, and published 13 reviews and literary criticisms, as well as numerous articles in professional journals. Roderick was the author of the book Habermas and the Foundations of Critical Theory (1986), which has been translated to German as: Habermas und das Problem der Rationalität. Eine Werkmonographie (1989). This page was last edited on 12 September 2018, at 15:18 (UTC).